This section from Giesler's memoir Ein Anderer Hitler deals with his correction of Albert Speer’s insulting statements about the Fuehrer at occasions when Giesler was present or knew differently because of his own experience with Hitler. To add some perspective to Giesler’s account, we remind you that Speer’s biographer Gitta Sereny titled her book, Albert Speer: His Battle With Truth. But these are nothing compared to what Hermann Giesler has to say. The following is found under the heading “Der zwiespältige Speer” in Giesler’s Ein Anderer Hitler. It begins with city visits the three of them made together for the purpose of furthering their architectural and city planning ideas. When he wrote about Hitler’s views on architecture [in his first book Erinnerungen (Reminiscences)] , Speer preferred to use Adolf Hitler’s visits to the cities of Paris, Augsburg and Linz to degrade Hitler with malicious remarks and arbitrary insinuations without recognizing how much he degrades his own credibility thereby. Basillica of Sacre-Coeur at the summit of butte Montmartre was NOT admired by Adolf Hitler, but was visited because it was the highest point in Paris from which to view the city plan. To put Sacre Coeur, which fits so well in the picturesque world of Utrillo,3 into Hitler’s architectural world is not only an insinuation but an intentional infamy. Because Speer knew very well that the last stop of our Paris trip was not Sacre Coeur, but the panoramic view from the Sacre Coeur of the city’s architectural layout. The same resentment can be noticed when Speer gives his opinion about Hitler and the city renewal of Augsburg. He uses much space for it and takes a chance to include in his remarks the “intriguing” Martin Bormann and, further on, also me. There you can read: “Hitler found in Hermann Giesler an architect who conceived and precisely executed his intentions. The first design of the Augsburg forum, however, was too similar to the planned Weimar project, also by Giesler. When Hitler criticized it, Giesler put a baroque crown on top and Hitler became enthusiastic." Indeed, that simple it was! My designs of the Augsburg forum never showed even the least similarity to the Weimar forum, although they did, at their first stage, not yet comply with Hitler’s idea of the Augsburgian city character which he wanted to be integrated into the new part of the city. After my first design, the Augsburg Tower was never changed. Speer writes further “That project was financed by postponing apartment buildings.” But it was not financed at all and never built. Model for the Augsburg Forum and Tower, designed by Geisler, that was never built. WHO’S TO BE BURIED IN LINZ? Speer’s description of the Linz city visit also needs explanation. Speer combines two visits of Adolf Hitler, September 1940 and spring 1943, into one. And he again talks it down and manipulates it. Is he not aware that he cannot recklessly spin his yarn? Did he stay to Hitler’s right side and I to his left or the other way around?4 Speer turns our visit to the Nibelungen bridge with the Siegfried and Kriemhild sculptures into a disgraceful tirade. Adolf Hitler had suggested to me that in judging those sculptures one should not see them as free sculptures but as decorative symbols of the bridge and its name. Maybe, he added, the base of the sculptures should not show a relief but a mosaic—to emphasize its decorative meaning. Niebelungen Bridge in Linz that Hitler rebuilt, as it stands today. Notice the tall sculpture that Hitler refers to at the entrance to the bridge. That “gigantic crypt in the clock tower" was, in my plans, an octagon room with a diameter of about four meters by five meters high, including the vault. And that vaulted crypt was to be the resting place of Hitler’s parents. It’s all nonsense, even though Fest quotes Speer’s yarn-spinning. But is it that important? Regarding the gravesite itself, not really; but rather in connection with Hitler’s idea to combine his gravesite with the Hall of The Party in Munich. This fascinating connection was the basis of my designs and trial models in autumn 1940, and also the topic of many talks after the city visit of spring 1943. Modern glass and steel building at Voest-Alpine today houses the financial and commercial departments. Speer describes by this short rendition what Adolf Hitler said about natural diversity and its consequent distinctions for the design of buildings. Clumsy, and in piecemeal fashion, Speer’s description of Adolf Hitler’s remarks lost the color and strength that, after all, so eminently signified Hitler’s ideas. His thoughts about the necessary security at your home, about the form housing projects should have, about the rationale of a glass wall conveying the hard, sober world of labor compared to the world of sensitive feelings—he mentions the magic of a Christmas tree—all that is missed in Speer’s description. Yet these remarks of Adolf Hitler comply with the events of our local tours. On the train he discussed with me, as the person responsible for the Linz renewal, questions about traffic, the modern railway station, and the introduction of a wide-rail track. When in the city itself, he spoke about the connection to the Autobahn and the continuation of the Landstrasse with its well-known burgher residences and baroque churches, and the new Laubenstrasse with its street-car system. We were standing at the Danube River—he said, “Giesler will give the river its proper setting; then one can really say Linz an der Donau—Linz at the Danube.” He named the buildings that were to be erected at that beautiful city landscape. What Adolf Hitler said, I absorbed, completely fascinated by his descriptions. Speer, however, felt differently. He writes, “Even though Hitler developed his plans with a serious, even solemn, expression, I did not think an adult was talking to me. For a split second, I imagined as if it were a magnificent play with little building blocks.” But why then did Speer push so hard to play with these little building blocks? Why could he never get over that it was not he but I who got the job in Linz, even though I never strove for it? We drove through the old part of Linz to the housing project and the buildings for the workers of the new factory. Adolf Hitler was shown the different plans for the apartments, he informed himself about the home furnishings, and talked to the workers and foremen. The slightly rising slopes to the West and North of the city favored living quarters. Hitler advised us to look for good traffic connections to the town center and also for the integration of green land. This was for me another reference before Hitler changed from the world of the architect to the blast furnaces, the steel foundries and the rolling mills, and then on to the halls of the Nibelungenwerk , the tank factory where tank officers and weapon experts awaited him. Between the talks about armament systems, Adolf Hitler turned to me, “See to it that the planned granite bridge at the East edge of the city can endure the heaviest loads”—pointing to the heavy tanks. This puts the lie to Speer’s credo: “I put priority on the overall planning, not the construction of representative buildings; not so Hitler. His passion for monuments of eternity left him completely disinterested in traffic structures, apartment buildings and green space—social dimensions he neglected.” Already during his Landsberg jail time,8 Adolf Hitler was dealing with traffic questions and drawing designs of the Autobahn. Stimulated by his youthful experience in Vienna and Munich and by his study of city planning, especially Paris, his own ideas of city planning developed. They were powerful and modern. With his support of motorization, he put the German street system in order and, at the same time, dealt intensively with the parking problems. He gave Dr.Todt the job to construct the Autobahn; he created the office of the Inspector General for the German Street System, a unique event in the history of German states. But aside from the individual traffic problems, he was aware of the great importance of the means of mass transportation—in the cities the subway, streetcar tracks, the U and S railway lines. He saw the crowning solution for track-type railway traffic in the realization of a common European wide-track train system. He requested solutions of the rail-freight traffic known today as container transport. His interest in air technology and air transportation was unquestionable and known to everyone. 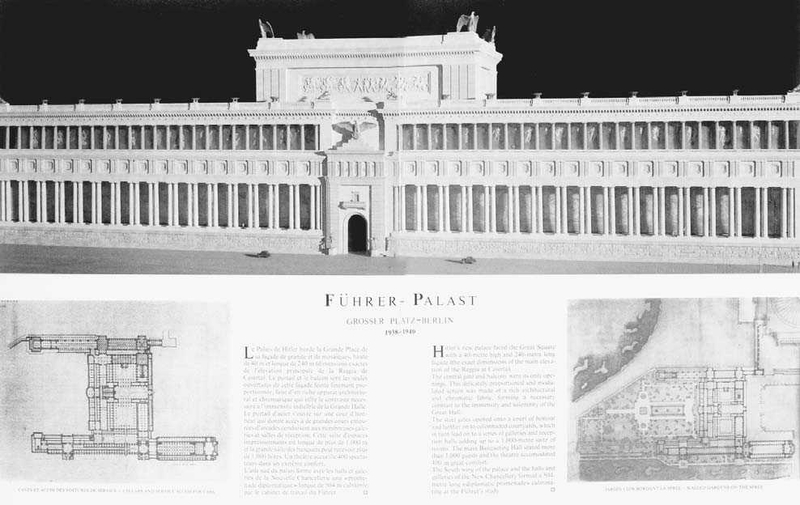 Speer's design for a Führer Palace which Hitler said was not for him but for those who will follow him. Click to enlarge. As far as flexibility, smartness and cunningness are concerned, Speer’s modesty is rather touching for someone who does not know him. In comparison, Papen was no match for him. So he saved his head but he traded it for twenty merciless years in prison. Twenty years prison—I doubt I could have endured it. Speer certainly did not believe he would be kept that long, with the exception of the last years, because events happened during that time—the Berlin blockade and Korea—which gave him hope for an early release. Speer, no doubt, did not believe in the mischievous harshness of those who, with full intention and severity, insisted on persecution and execution and—God knows—still do it today. He reckoned with the success of the efforts of his daughter, Hilde, and the formal promise of support by Konrad Adenauer, Charles de Gaulle, Heinrich Luebke, Willy Brandt, Carlo Schmid, Herbert Wehner and Pastor Martin Niemoeller, the Lenin order bearer. He hoped! Even though he wrote in his diary in his 14th year: “…in the evening a hopeful report by Hilde. But these are her hopes, not mine." Well, they were his also. 1) Nicolaus von Below, At Hitler’s Side, Greenhill, 2001, p 28. Original in German 1980. 2) Christa Schroeder, He Was My Chief, Frontline Books, 2009, p. 159. Original German edition 1985. 3) Maurice Utrillo was an untrained and prolific French painter who specialized in cityscapes of the Montmartre quarter of Paris. His popular scenes are often found on postcards. 4) An allusion to Speer’s preoccupation to be always on Hitler’s right side which is considered to be the preferential side. 5) The Pre-Raphaelite Brotherhood was a group of reform-minded English artists and critics who scorned the academic art of their day (1850’s). 6) A German historian, journalist, critic and editor who was a leading figure in the debate about the Nazi period. 7) Joachim Fest, Hitler, Berlin, Propyläen, 1973. 8) Hitler spent nine months in Landsberg Prison in Bavaria following what is called the “Beer Hall Putsch” in November 1923. 9) Geoffrey Barraclough, “Hitler’s Master-Builder,” The New York Review, 7-1-1971. 10) Albert Speer, Spandauer Tagebuecher (Spandau Diaries), Verlag-Ullstein, 1975. 11) Hjalmar Schacht, Reichsbank president 1933-1939 and Minister of Economics 1934-1937. Franz von Papen, Chancellor of Germany June 1-Nov. 17, 1932. 12) Karl Friedrich Schinkel, a Prussian architect, city planner and painter who died in 1841 is one of the most prominent architects of Germany, known for both neoclassical and neogothic buildings.